Directors – Hiroyushi Seshita & Kobun Shizuno, Screenplay – Gen Urobuchi, Music – Takayuki Hatton, Production Design – Ferdinando Patulli & Naoya Tanak. Production Company – Toho Animation/Polygon Pictures. In the aftermath of the failure to kill Godzilla with the evolved nanometal Mechagodzilla city, blame is placed on Haruo Sakaki. Aboard the Aratrum in orbit, the various alien races and humans are in conflict. The Bilasaludo abruptly announce they are turning off the power on the ship until Haruo is charged. Meanwhile, Metphies of the Exif tells Haruo that the solution to destroy Godzilla is to acknowledge their god – Ghidorah. The humans aboard the Arartrum accept bowing to Ghidorah only to realise too late that this requires them to sacrifice their lives whereupon they are consumed. Doing so summons Ghidorah from another dimension where it proceeds to ensnare Godzilla in its energy ribbons. What Haruo realises is that Ghidorah is a creature that destroys every planet it is unleashed upon. Godzilla has enjoyed enormous success on cinema screens, appearing in 30 live-action films since his first appearance in Godzilla (1954). (See below for the other Godzilla films). 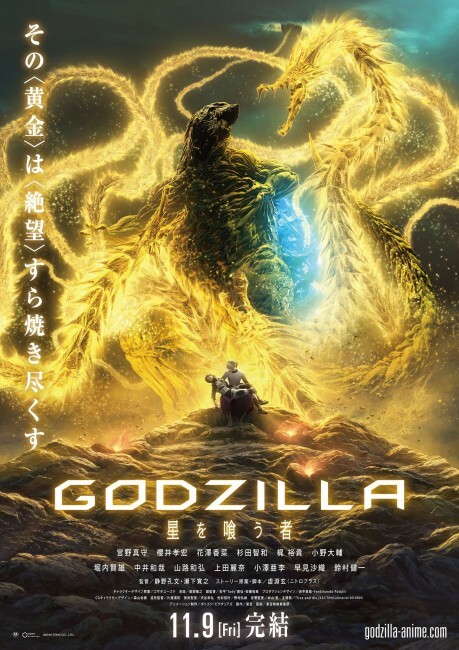 Toho took a new approach to the familiar with Godzilla: Planet of the Monsters (2017), which became the first anime version of Godzilla (although not the first animated one as there had been two earlier US-made tv series). Even more ambitiously, Planet of the Monsters was the first in a trilogy of Godzilla anime films and was followed six months later by Godzilla: City on the Edge of Battle (2018) and concluded five months after that by Godzilla: The Planet Eater here. Planet of the Monsters disappointed but it felt like the anime series was getting its act together by the time of City on the Edge of Battle. There you could see it marshalling aspects of the Godzilla saga together into a grand reconception that dazzled with the boldness of its scale. You could also see it laying the groundwork to introduce Ghidorah and Mothra, the two monsters that Godzilla has most regularly fought on screen. With The Planet Eater, these ideas come to fruition and the anime Godzilla saga comes to a conclusion. (Or at least it would be interesting to see where any further entries take the story after this point). I was hoping that The Planet Eater would hit the same heights that City on the Edge of Battle did with its conceptual ingenuity. We finally get to see the reconceptualised Ghidorah. In its initial appearance it emerges out of a singularity (later multiple singularities) as a three-stranded ribbon of gold energy that stretches down from the clouds to ensnare Godzilla. It is not until some way in (the latter third) that we get to see it in its familiar three-headed lizard form. Indeed, this and the honorific ‘The Planet Eater’ is something that make Ghidorah resembles something more akin to Galactus of Marvel Comics fame than the Ghidorah/Ghidrah we know. Alas, after the inspired height of City on the Edge of Battle, The Planet Eater falls into the same pitfalls that Planet of Monsters did. No monsters appear for the first forty minutes. Instead this is taken up with in-politicking between the humans and the two factions of alien races aboard the orbiting Aratrum ship, which prove nowhere near as interesting as the monster show we have come to see. 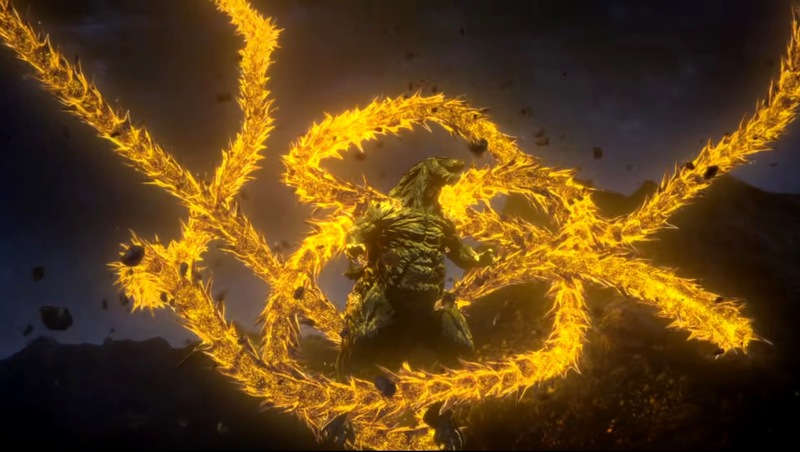 Even when the monsters do turn up, much of the film has Godzilla ensnared in Ghidorah’s energy ribbons and it is only at the end that it released for the good old-fashioned punch-up we expect of a Japanese monster movie. Even more disappointing is the appearance of Mothra – after the build-up through the previous film, all we get is less than a minute’s appearance where it does not engage with the other monsters and the dialogue on the humans’ part seems to only consist of variations on “Did we just see a giant moth?” after which it disappears. The film also reaches a downbeat ending. There is a strong strain of environmentalism and respect for nature in Japanese cinema that runs all the way from the 1970s Godzilla films to most of the works of Hayao Miyazaki. This is taken to an extreme here [PLOT SPOILERS] where in the aftermath the survivors are living back to nature among the Houtua and one of the Vipers is reactivated and Haruo decides the only option is for him to fly it towards Godzilla and allow it and himself to be incinerated in Godzilla’s breath to prevent civilisation and technology from happening all over again. The other Godzilla films are:– Godzilla, King of the Monsters (1954), Gigantis the Fire Monster/Godzilla Raids Again/The Return of Godzilla (1955), King Kong Vs. Godzilla (1962), Godzilla vs the Thing/Mothra vs Godzilla (1964), Ghidrah the Three-Headed Monster (1964), Monster Zero/Invasion of the Astro Monster (1965), Godzilla vs the Sea Monster/Ebirah, Horror of the Deep (1966), Son of Godzilla (1968), Destroy All Monsters (1968), Godzilla’s Revenge (1969), Godzilla vs the Smog Monster/Godzilla vs Hedorah (1971), Godzilla vs Gigan/Godzilla on Monster Island (1972), Godzilla vs Megalon (1973), Godzilla vs the Cosmic Monster/Godzilla vs the Bionic Monster/Godzilla vs Mechagodzilla (1974), Terror of Mechagodzilla/Monsters from an Unknown Planet (1976), Godzilla 1985 (1984), Godzilla vs. Biollante (1989), Godzilla vs King Ghidorah (1991), Godzilla vs Mothra (1992), Godzilla vs Mechagodzilla (1993), Godzilla vs Space Godzilla (1994), Godzilla vs Destoroyah (1995), Godzilla 2000 (1999), Godzilla vs Megaguirus (2000), Godzilla Mothra and King Ghidorah: Giant Monsters All-Out Attack (2001), Godzilla Against Mechagodzilla (2002), Godzilla: Tokyo SOS (2003), Godzilla: Final Wars (2004) and Shin Godzilla/Godzilla: Resurgence (2016). Both Roland Emmerich’s Godzilla (1998) and Gareth Edwards’ Godzilla (2014) are big-budget, English-language remakes.